This entry was posted on Saturday, October 27th, 2007 at 11:14 pm and is filed under Finished Object, Knitting, sweater, Uncategorized, Yarn. You can follow any responses to this entry through the RSS 2.0 feed. Both comments and pings are currently closed. 7 Responses to Tubey is finished! It looks terrific! You keep knitting things that I’ve been keeping an eye on for a while. It’s pretty cool, actually. 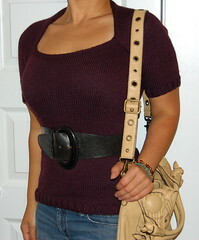 Love the yarncolor, the fit, everything about it ! Ik hou er ook van, en het is mooi en mooie wol en kleur. Ik werk veel met Lana Grossa. Wat een prijsverschil, zoveel betaal ik niet hoor. Het varieert van 3,95 tot 7.95 euro per bol=50 gram. Maar wel handig die Yarnindex van Lana Grossa. Ik ga die eleanore sjaal proberen, ik heb het patroontje gevonden. Another beautiful creation by an equally beautiful person. I’m so proud of you. 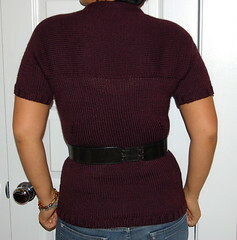 Found the pattern for this sweater yesterday and fell in LOVE with it. Your interpretation is gorgeous! 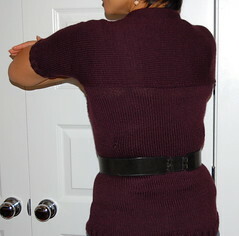 Just one question–how does the back of the sweater lay on your neck? Does the edge curl in just a bit? Again, gorgeous!